And although it’s relatively simple to get a site search engine up and running on an e-commerce site, the real test is in its operation. How well does the search engine understand your visitors’ input? How quickly does it retrieve results? How accurate are the results it displays? If you’re considering implementing a site search engine on your own website or you know your current site search could be improved, it’s time to take a closer look at the most important points to keep in mind when choosing a site search engine, and what to look for when evaluating site search companies so that you (and your customers) get the best possible results. The first step in having a site search that people actually use lies in the experience of people actually using it. You may also believe that if a part of your users’ search terms are only one word, that a more robust e-commerce site search engine isn’t necessary. However, search queries of two or more words show a higher correlation with increased conversion rates. Simple site search engines cannot understand the intent behind more advanced or complex search queries, meaning you may be missing out on those lucrative conversions. 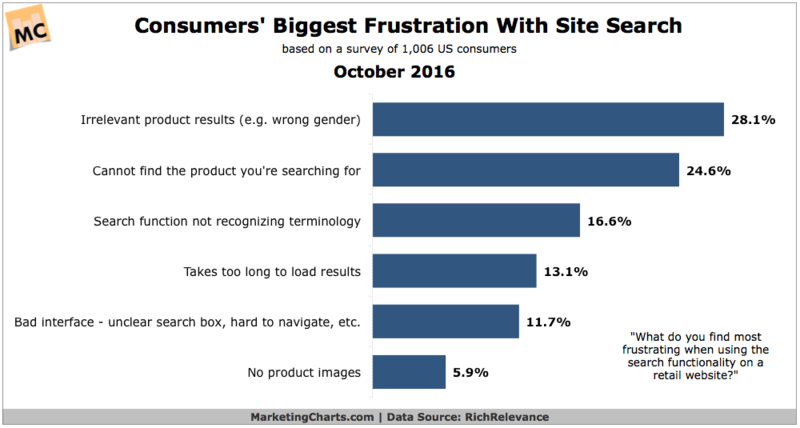 But on the other side of the spectrum, people are going so far as to search for exactly what they want from an e-commerce site, and the search still isn’t returning the results they want. This goes doubly so for searching a site on a mobile device, where users often have to resort to using the same terminology and language on the site to conduct their searches or scour complicated and deep category lists to try and find precisely what they want. If they can’t get accurate results, they’ll simply go elsewhere. 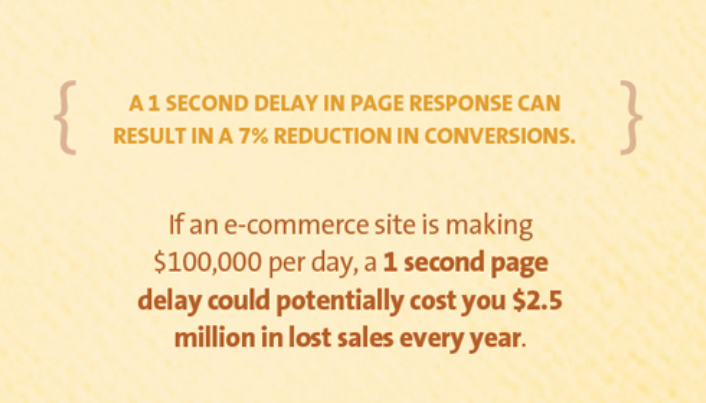 Not only does this cause your bounce rate to go up, it causes you to lose conversions and sales. Yeah, But How Many Sales Does Site Search Really Generate? The research from our own clients at SearchNode shows that they usually generate between 20-60% of all their e-commerce revenue from users who utilize the site search. Of course, these numbers vary greatly depending on the industry and other factors, but it proves just how crucial site search is as part of an overall e-commerce strategy. See for yourself by checking your own analytics. What is your e-commerce conversion rate for users who utilize your site search engine? The numbers may surprise you! 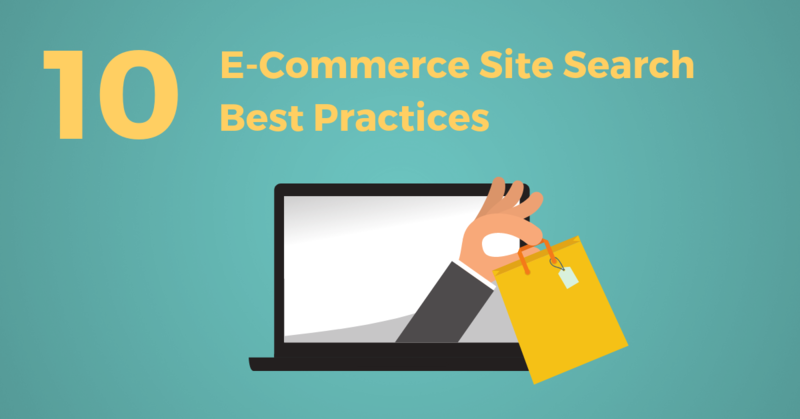 Now that you have a clearer picture of how site search can make or break your e-commerce website, the next question becomes — what can you do about it? For many e-commerce businesses, site search is more of an afterthought that is “bolted on” to an existing website, rather than something that is thoroughly researched and integrated as part of the overall user experience. Natural language search, also called NLP or natural language processing is the ability of a computer program to understand human speech as it is spoken. The most common uses of this technology at present are when you tell Amazon’s Alexa to play a song, or you ask Siri to call someone from your contact list. But the field is wide open in terms of its potential. With regard to site search, NLP can be used to not only extract valuable data on consumer searches, but it can also be used to more accurately target results based on what isn’t said, in addition to what is. Here, accuracy is of vital importance. 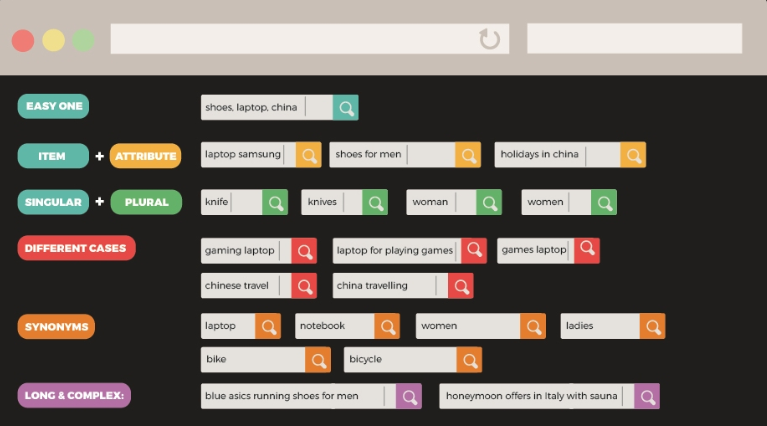 But searches can become much more complex thanks to the nuances of language. Ideally, the e-commerce site search solution should be able to understand and differentiate between a wide variety of queries. But this is just one, relatively simple, example. A truly intelligence site search engine needs to understand the complexities and nuances between multiple languages, including grammar rules and structure. 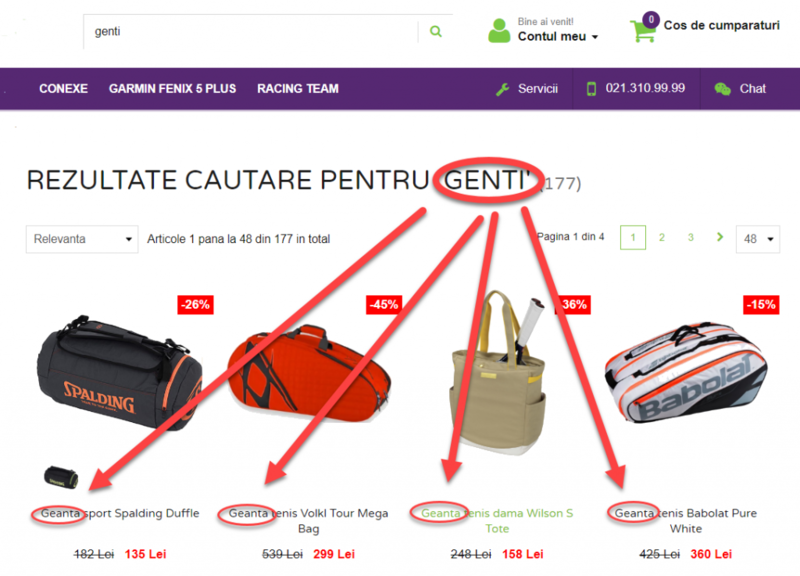 At Sportguru.ro, a search for bag (geanta in Romanian) and bags (genti) needs to return the same results regardless of whether the term used was singular or plural. 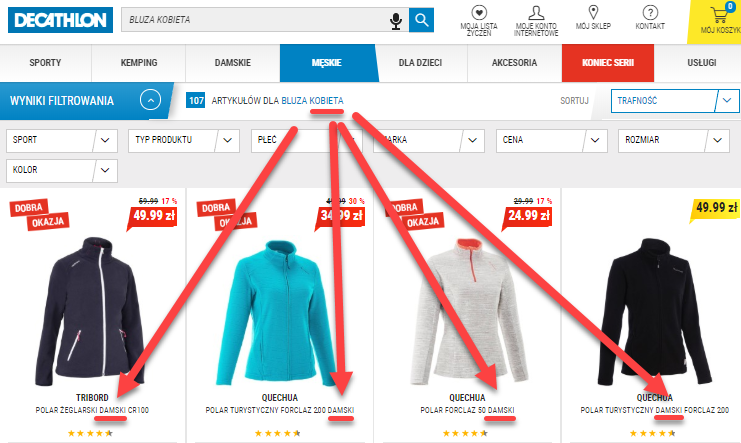 In this example, from a Polish retailer, we are looking for a women’s sweatshirt. The search engine is smart enough to understand that the term we used, Kobieta, means sweatshirt, but that the term used throughout the site, Damski or Damska, is also acceptable, and returns results accordingly. Intelligent site search understands the user’s query, even if it doesn’t match the term used throughout the site. 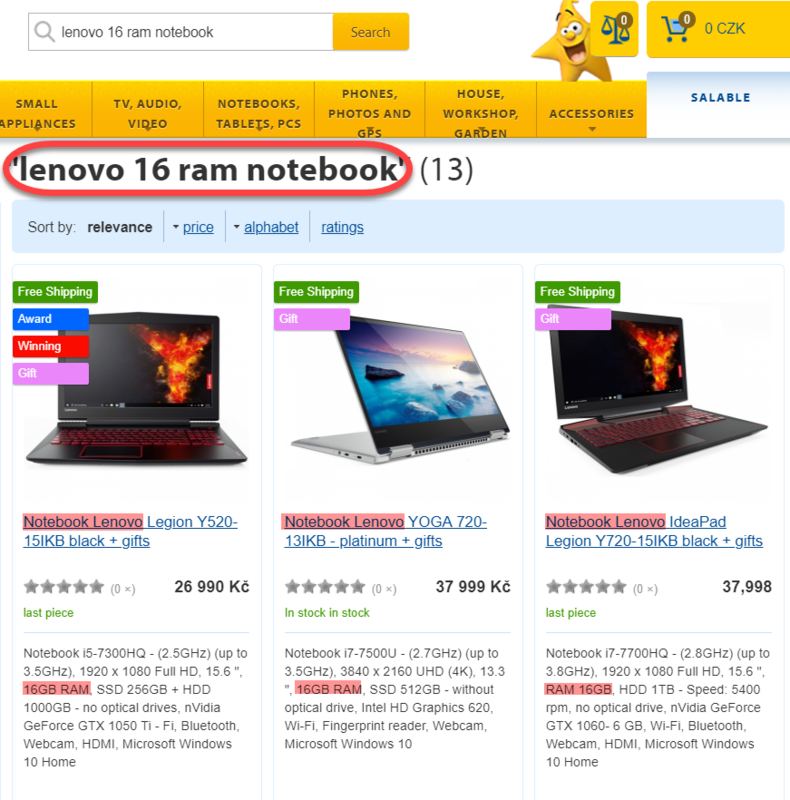 In the example below from Euronics.cz, an electronics retailer, we performed a complex search for “lenovo 16 ram notebook”. With most site search engines, we’d be given results that include desktop computers with 16 GB of ram, or laptops which aren’t Lenovo brand. Here, the site search was smart enough to return matches that included the brand name, the specified amount of RAM and all laptops, demonstrating the search engine’s ability to juggle multiple specifications easily. 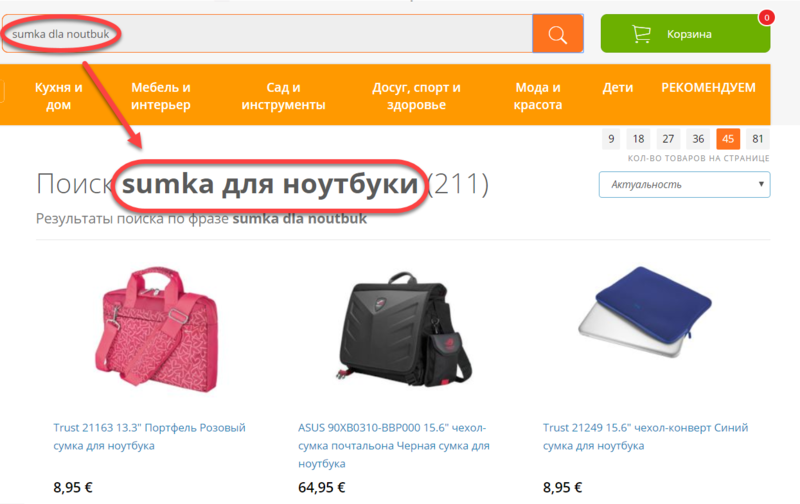 Conducting a search for a notebook bag on Latvian e-commerce website Xnet, allows for transliteration both to and from Russian (Cyrillic) and Roman alphabets. 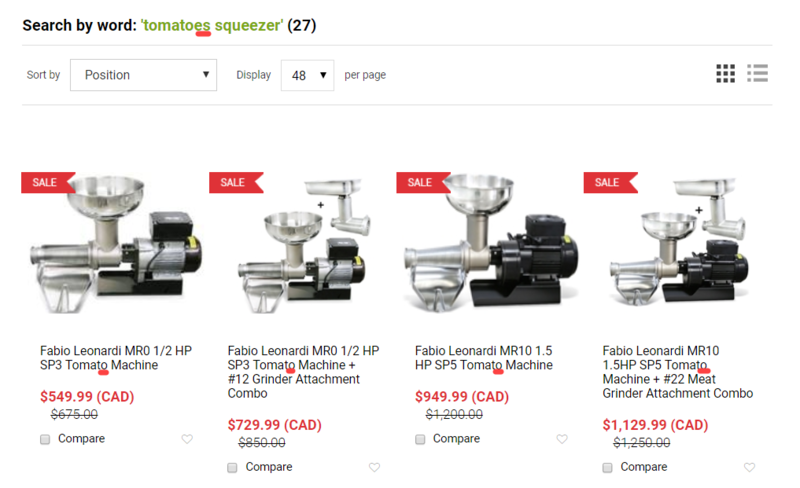 But these examples are only scratching the surface of e-commerce site search. The most intelligent e-commerce site search engines leverage autocorrect, to intuitively understand what the user is searching for as they search for it, and anticipates their query by returning relevant results before they’ve even finished. When you have hundreds, or even thousands of products, being able to anticipate the user’s query before they finish typing saves time and gets them to the right product faster. Autocomplete can help. 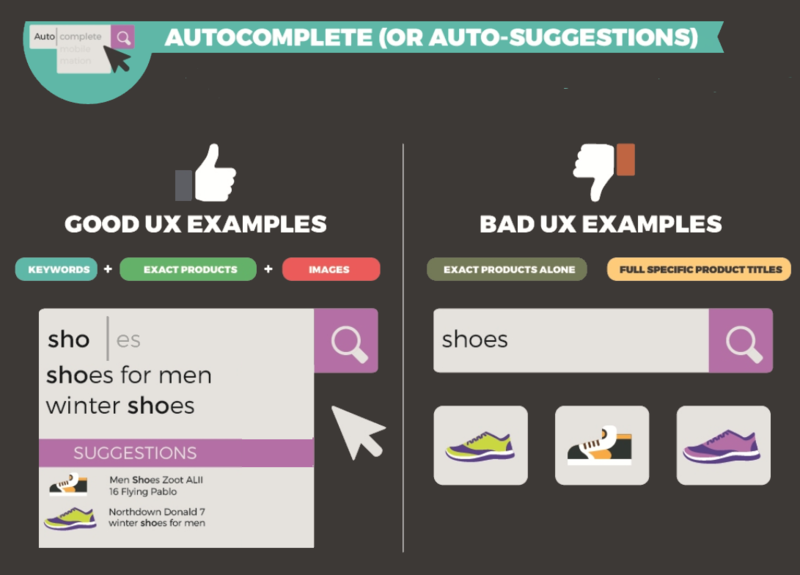 By anticipating and serving products as the user types, they’ll be able to find precisely what they need rather than slogging through page after page of results. Here, we look to the leading search and e-commerce companies for inspiration. If you can give your users an autocomplete search experience similar to Google or Amazon, they’ll immediately feel familiar with and accustomed to searching your site. Once the target keyword(s) are auto-completed, the system should then recommend products accordingly. This leads to a very high conversion rate, as you’ve just matched the user’s query in seconds, rather than forcing them to scroll through countless results. And if you need specific customization work done with regard to your own brand of products or other particular features, your search solution should allow for this capability, not simply leave you feeling “stuck” with the default parameters. Despite the user’s best efforts, sometimes typoes can happen. This is particularly true concerning brand names. Even if you carry a specific brand, if there’s a spelling error, the results may not show for your user. By enabling a robust spell-check, your site search engine can correct the user as they type to maximize the chances that they’ll get the result they want. Mobile search is nothing like desktop search, and trying to squeeze all that information into a tiny screen is only causing your users endless frustration. Because consumers are limited by a small screen and tactile search and filtering, the best mobile search experience has to be built with these requirements in mind. Having a large, prominent search box, together with relevant auto-complete and rapid return of results can make an incredible difference in the user’s shopping and search experience. When you have dozens or even hundreds of relevant search results, how do you expect the user to sift through them all? 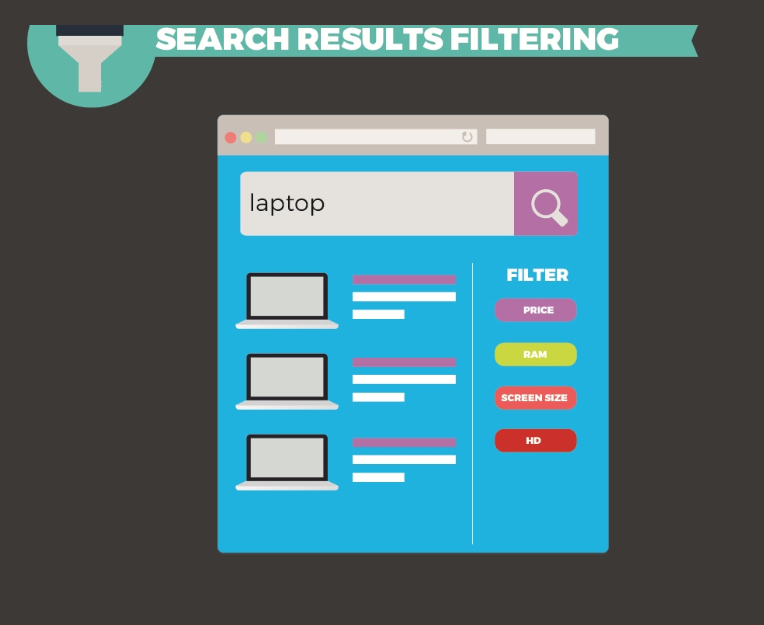 With contextual filtering, you give the user control over their search experience, letting them adjust various attributes like price range, size, brand and so on, to narrow down their ideal result with laser-like focus. Not only does this provide the user with far greater flexibility, it also greatly increases the probability of a sale. Although some form of site search is often built into e-commerce and shopping cart platforms, many retailers choose not to use it because there’s a noticeable lack of merchandising options for the results that are returned. E-commerce website owners often cannot change the order of products displayed or filter out certain categories, making the site search results page more of an “all or nothing” decision. Fortunately, it doesn’t have to be that way. New, innovative technologies are available in enterprise site search platforms that allow for proper “searchandising” — that is, allow online retailers the ability to give different “weights” to various products and their attributes so that they have more precise control over which results are displayed, and when. For example, the best site search engines allow you to assign certain categories to be displayed first based on the criteria you select, including number of sales, click-through rate of the products, stock updates, trending products and more. All of this information can be determined with AI algorithms. You can choose to show specific items that match all relevant queries, so that particularly popular, trendy or seasonal items appear first. Most “out of the box” site search engine solutions will consult with e-commerce retailers from a technical and implementation standpoint, but few will venture into consulting with them based on their “searchandising” potential. This is where working with a smart, dedicated enterprise-grade e-commerce search provider can make all the difference. Properly merchandising your search results will also allow you to show recommended items even if you don’t have any exact matches for the user’s query. In this way, you not only deliver improved search results, but you also generate more sales and greater exposure of the types of products you want to promote. Artificial intelligence has come a long way in recent years, and with these great strides come the potential to learn from and capitalize on not just the user’s search itself, but the intent behind that search. In the example below, we found 13 relevant results. If a typical user sees this, he might not want any of the retrieved results for whatever reason. This is where most search engines would stop. But it’s understood that he has a high intent to buy, so why let him go so easily? Instead, your site search should be proactive. This isn’t to say that it should be mindlessly filling up the page with irrelevant results, but it should understand enough to be able to provide similar results — hypothetically, 16 GB ram notebooks that may not be Lenovo, for example. Being able to personalize search results based on a user’s browsing history, level of interest in a product and other factors can greatly help improve your site’s conversion rate. It is the modern-day digital version of your own personal shopper. For example, if a user has been searching the site and looking over product pages for Samsung smartphone, their subsequent search results would notice and catch this search trend, and boost search results of the same Samsung brand, thus increasing the probability that the user will ultimately buy. Only 7% of companies report they’re efficiently learning from internal site search data & using that in other areas of their business. This means that there’s a lot in the way of potential revenue, improved customer retention and brand loyalty left untapped. By properly understanding and leveraging site search data and learning how to apply it to other areas of your site and your business, you’ll be setting yourself up for exponential levels of success. It’s worth noting, however, that search performance shouldn’t be an end-goal. Rather it should be something that is consistently updated and adapted based on search performance, popularity and trends. As you no doubt know, fidget spinners were hugely popular with kids and teens. But many e-commerce businesses missed out on this trend because they assumed that nobody would search for or buy this item from a website. But there were some savvy businesses who capitalized on this trend by analyzing their search stats and seeing the trend for fidget spinners grow. They saw an opportunity and pounced on it. And fidget spinners are just one of many examples. This same pattern repeats itself again and again as more products achieve a sudden and incredible spike in activity, and smart, adaptive e-commerce site search engines can track and monitor this, uncovering unconventional “gold nuggets” like fidget spinners that could be poised to explode in popularity. Finally, the delivery of these results needs to happen almost instantaneously. Users don’t have the time or the inclination to wait for the AI to crunch all the variables and adjust all the results. And if your site search takes too long, no matter how relevant the results may be, people will simply go elsewhere. Any online retailer can buy an “off-the-shelf” e-commerce site solution. But how often is the company actually there for you once the implementation is done? With the wide range of products and services that can be sold online, you need a commercial-grade site search solution that can be fully customized — not just in terms of design and integration, but in terms of overall resource planning and algorithm updates — providing you with a completely tailored system that is built to incorporate all of these points. 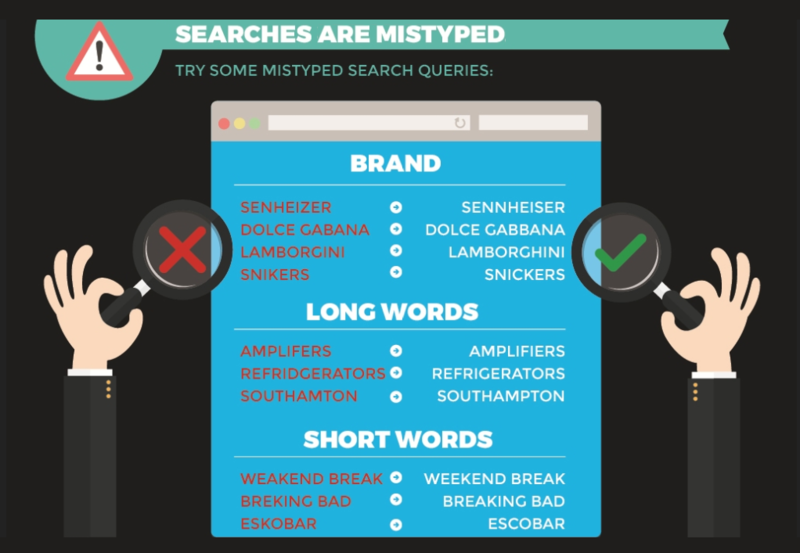 Does Your Site Search Do All of This? Integrating a site search with all these capabilities can seem overwhelming, but the payoff in terms of an improved customer experience, greater customer retention and overall brand loyalty is amazing. 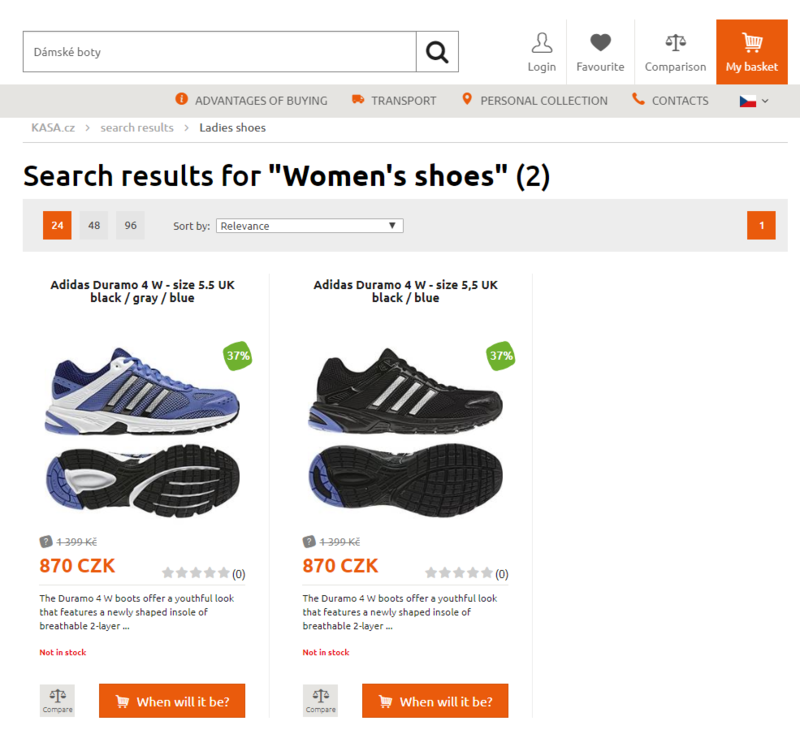 These points and examples illustrate the many ways that your e-commerce site search can be improved to more accurately retrieve and present relevant results in a rich, engaging atmosphere. If you’d like to see how your site search is performing and whether or not you’re giving your customers the best possible search experience on your e-commerce site, click here to get your FREE website search analysis. This detailed site search analysis will be performed individually for you by a dedicated site search expert. The report is designed to help you understand where users may be falling out of your funnel and help you reach and retain more customers through a smart, powerful on-site search solution.